This is part 2 and please read part 1 here for better understanding the whole story of my points of view on SUMATEC. I was surprised with the news came out yesterday on SUMATEC. The company guided on its oil production growth and potential profit they can make. With this guidance, I reaffirm the share price of SUMATEC can reach to my DCF valuation of 56sen for FY18 while for short-term is 25sen. Like I said in previous article, my assumptions are conservative to avoid any potential upset when crude oil prices fall while I believe the management's forecast could be much higher than mine. Yes, they are because they are the one operate the oil fields, so they know better real costs and profit. Therefore, this give confident that my FY18 DCF value is realistic and can be met! The company expects total oil production to increase to 7,500/b daily by end of this year. This means next year will see full year of oil production of 7,500/b daily. Annualised it, we will get 2.74 million/b for total oil production by the Company in FY19. Meanwhile, my forecast for total oil production by the company next year is 2.66 million/b. And my oil production forecast for FY18 is marginally conservative not lower than Management. The company expect to make net margin of 60%, which USD30/b at least from market / selling prices of USD50/b. Assuming there is other costs and some hidden costs to be deducted, they could still make at least 40-50% net margin. Meanwhile, my forecast for net margin is only around 28-31%. 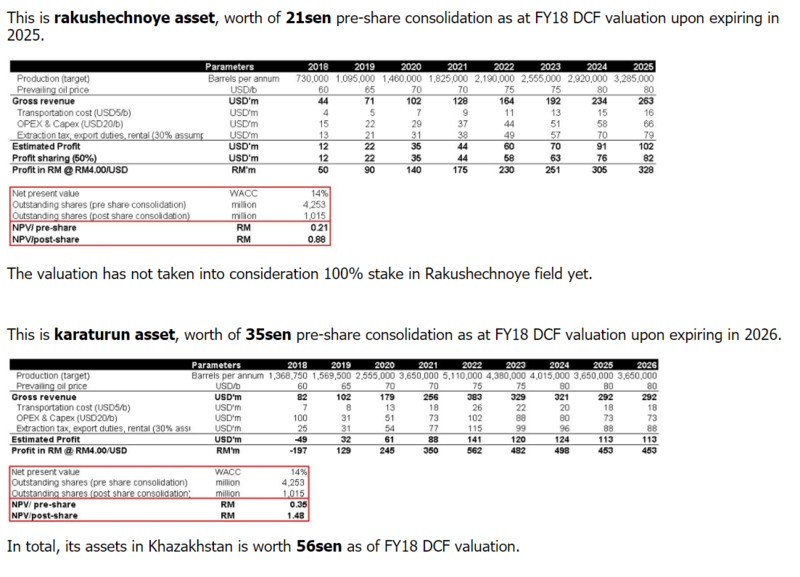 Why my valuation is based on DCF not PE ratio? 1. Its oil field/assets are concessionaire, which have expiry date. So, we want to value the whole potential profit throughout concession period. 2. DCF take into consideration the impact in real earnings, cash flow and balance sheet (working capital). So, this removes uncertainty or risks in valuation. For example, the plunge in the share price of Sapura Energy to low of 68sen due to the concern on its fundamental following bad recent results. So, it is important to know its whole value after financial loss, which directly impact dilution in its cash, shrank in operating cash flow, payment capability for high debt and high spending on capex. 3. DCF has WACC, which indicates it takes into account the average rate of return for the company to compensate all its different investors. I know it's very hard to digest this penny company can make a comeback. But I believe, in this world everything starts from scratch before it grows bigger. The important thing is do not underestimate a small company and understand its operation. From there, you can decide and make a judgement. TOP glove was on second board in the past before you see where it is at TOP right now. 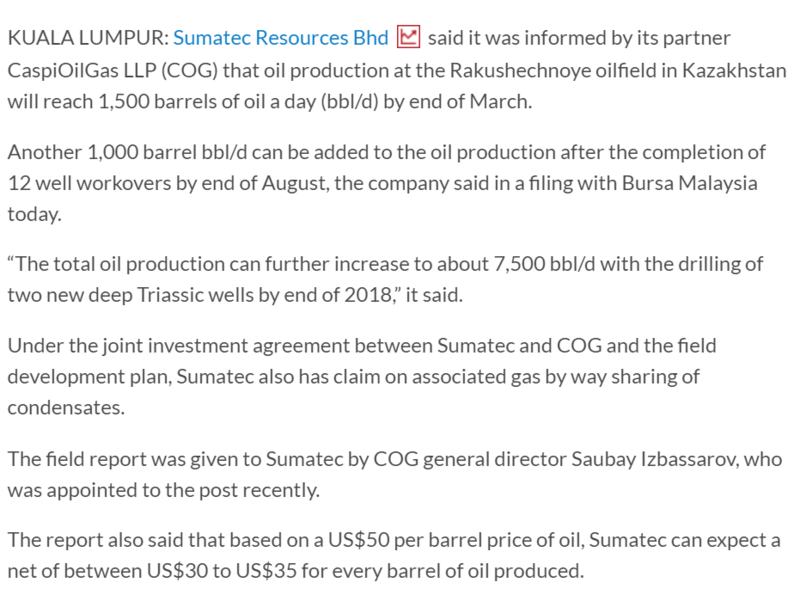 So, SUMATEC is a PETRONAS in the making in Khazakhstan. We will see its results to turnaround this year and even higher given favourable oil prices. As they can make huge margin at oil price of USD50/b, can you imagine how big and sustainable is its profit based on oil prices at USD60/b above. At the time of writing, Brent is at USD69.80, nearly to touch USD70/b and WTI also make fresh high. The company also clean, no borrowings. It is time to reap the fruit of the past painful and restructuring. Things start to fall in place and favour SUMATEC now. It is also a time to switch from upstream players like UMWOG or Sapura Energy, HIBISCUS, KNM, REACH to the BEST and still laggard upstream player, SUMATEC.